We will do our best to lead the boring machine industry by manufacturing the world best quality TBM. TBM maker JTSC from japan. EMKorea made an agreement with JTSC about coproduction and sales of large scaled TBM which is up to 15m. It will enhance safety of construction site and environment protection but also economical construction. Mud which is pressure injected into the cutting face is mechanically mixed and agitated with the soil to produce muck. The volume of this muck is adjusted with the screw conveyor, and it is filled between the cutting face and shield bulkhead, then pressure is applied by the shield's propelling pressure.Because this earth pressure is applied to all the cutting face and excavating is executed while maintaining stability in the cutting face, this type of shield machine is applicable to a wide range of ground condition. Slurry is fed into the cutter chamber and the properties of slurry and slurry pressure are used to resist the earth pressure and water pressure which work on the cutting face to stabilize the soil being dug. At the same time, the soil which is dug is transported in circulating slurry while the shield machine works its way forward, so that this type of shield machine is applicable to a wide range of ground condition. These are bedrock and gravel shield machine which utilize IHI's tunnel boring machine technology. Roller cutters and tooth bits can be replaced from inside the cutter chamber. 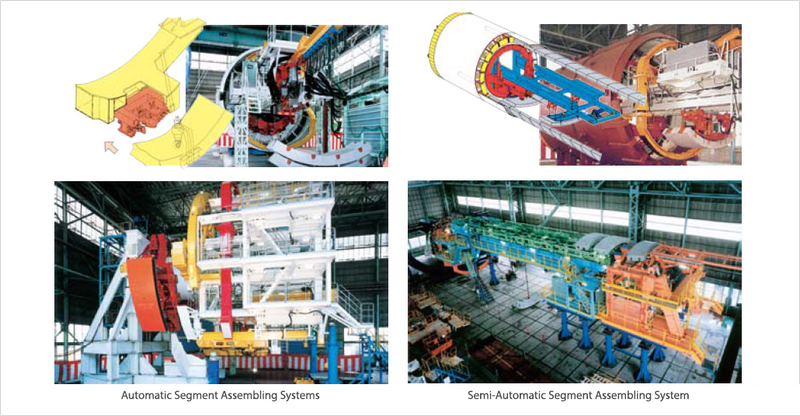 In special-form shield machines, in addition to a single-arm type of erector, an erector for center pillar is also equipped to allow easy assembly of segments. The MF shield machine can excavate a multicircular tunnel by offsetting the cutter heads of multiple circular shields forward/backward and using the partly overlapped shield section thus created. The H&V shield machine has a special articulation feature and its multi-circular shield section allows a spiral tunnel to be excavated from a vertical direction to a horizontal direction, or vice versa. By making the cutter frame move in a parallel link, rectangular, oval, horseshoe shaped and circular cutting profile can be excavated at will. This construction method allows the construction of shield tunnels with rational cross sections for the effective use of underground areas. Daiho Construction Co., Ltd. developed this construction method, and IHI was the first to manufacture a practical model. Cutter bits are mounted in a cutter frame similar to the diagram below. This cutter frame is connected to a rotational drive shaft through a crank, so that the cutter has a circular movement while remaining parallel (parallel link movement). Therefore, by using a cutter frame which is approximately the same shape as the shield section, shield tunnels of any shape can be constructed. Harmonica tunneling method is a method for constructing a large section tunnel by integrating tunnel sections that are excavated by using a small rectangular shaped shield machine repeatedly. This method can be used for excavation of tunnels at shallow depth, along curved alignment and those with length exceeding 100 meters. It allows efficient excavating of underpass of the intersection or railroad crossing without open-cut construction. 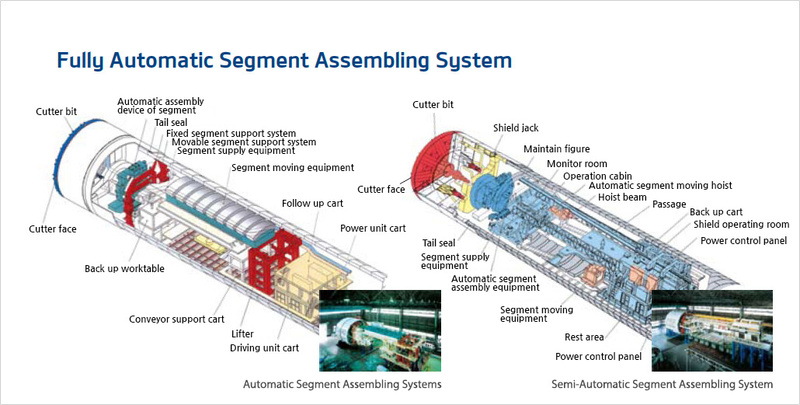 This method is jointly developed with Taisei Corporation. This shield machine constructs a vertical shaft while ascending from an existing horizontal shaft, towards the surface of the ground. With a single shield machine, three vertical shafts can be constructed by collecting and reinstalling the machine after it has arrived at the ground surface. This excavation machine implements underground docking by constructing a vertical shaft (oblique shaft) while descending from the surface of the ground, towards an existing horizontal shaft. Rotating shield machines allow a single machine to excavate shaft and tunnel continuously from the surface. Applied techniques for rotating shield machines have made various types of next generation shield techniques possible. Inclination shafts can be excavated from an arbitrary diagonal angle and then change to horizontal excavation. In addition, these rotating shield machines have made turning shafts unnecessary, they allow speedy and safe bit replacement, and they also allow construction of shafts under high water pressure. These shield machines allow a single machine to continuously excavate a tunnel after excavating a shaft from the surface. Because these machines have shaft excavating functions, caissons and continuous diaphram which were required in conventional methods are no longer needed, so that the land necessary for constructing chafts can be reduced. In addition, construction is simple, construction times are shorter, and expenses can be saved. This is the ultra-long distance and high speed tunneling shield machine in which the elemental technology of JTSC including the technology for durability of bits and other tools, speed-up of each equipment and automation of the segment assembly is applied. Equipped with the mechanism to excavate in parallel with the segment assembly, it enables even faster excavation. These shield machines are able to simultaneously assemble segments while excavating. This greatly reduces construction time. ③ One segment ring completed. Both large diameter tunnels and small diameter tunnels can be excavated just with one shield machine. It allows the child shield machine to separate and depart by sharing the cutter. The cutter section of the docking shield machine is such that it docks deep in the skin plate. The inserting shield machine enters the docking shield machine and a fixing agent is injected into the hood wrap section to dock the shield machines underground. This method was developed jointly by Chubu Electric Power Co., Inc. and IHI. This shield machine directly cuts segments through the tunnel where the primary lining has been completed and starts sideways. Selecting a cuttable segment, the machine is equipped with the cutter shape that is suitable for the segment cutting. The shaft is no longer required and both the economic efficiency and the safety are ensured. These machines are effective when excavating in the same direction for long distances. Bits can be replaced simply by rotating the cutter, so that conventional ground reforming construction is not necessary. This is a construction method which is very efficient and safe. A diametrically reduced face plate with roller cutters is contained in the rotary body of this machine, and after rotating through 180 degrees, the machine allows the cutter bits to be internally changed for the appropriate ones according to the particular nature of the soil. Cutter bits of the shield tunneling machine become more worn when the tunneling distance is longer and they need to be replaced when the wear of the cuter bits exceeds the limits. There are various ways to replace cutter bits, including the replacement by constructing a vertical shaft, by face operation after ground improvement and by using the special machinery; however, those have problems of high cost, non-safety and the prolonged work period. “Shark-bite method” realizes the unlimited replacement of old cutter bit with new ones, just like shark teeth. IHI conducted full-size experiments on the watersealing performance and durability of cutter seals, and developed a highwater- pressure cutter seal. This seal has been adopted in numerous shield machines and gained high evaluation. The high-water-pressure tail seal and a special material charged inside it are high in water-sealing effect and can therefore withstand high water pressures. This cutter is used to cut the draining materials imbedded underground for ground improvement. This system is made up of an automatic shield machine location measuring system and an automatic shield machine alignment control system. The automatic shield machine location measuring system uses a gyrocompass and a gravity acceleration meter to detect the attitude of the shield machine, then the position of the shield machine is calculated from the distance it has progressed. This unit achieves highly reliable clearance measuring by mechanical measurement with a probe. When it is not capable of towing the back-up car from the shield machine, the back-up car clamps the rails and drives itself.